We arrived on Thursday night and headed over to Rebecca and Peter’s house in Beverly…just north of Boston. They brought us to a great little Thai place just a few minutes from their house and I was able to get my fix of green curry with tofu. Oh the joy! After that, we headed back to their house and had pumpkin pie on their deck. The next morning, we met at their house before heading to the train station. We were about to take our very FIRST train ride into the city! We were giddy with excitement. I’m sure the locals got a kick out of me taking photos of the train schedule, the tracks…you know It’s pretty hard to hide the fact that we’re “not from ’round here”. The Traffic: Oh my. Yes, everything said about Boston drivers is true. They are beyond crazy. People constantly cut you off, fail to use signals, speed like maniacs…it was an experience. The Train: With all of the insane drivers, it was so GREAT that we didn’t have to drive into the city. That was a really new concept to us…and it’s just so fun and convenient. The Old North Church: It was so cool to stand in the exact spot where Theodore Roosevelt stood…and to see the pulpit where John Wesley preached God-inspired sermons. The Cemeteries: They are so fascinating. 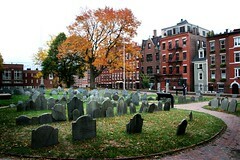 Many of my direct ancestors are buried at The Granary Burial Ground right in Boston. We tried really hard to find the headstone of one particular woman, Mary Chilton, who came across on the Mayflower. We couldn’t find it. Did you know that nearly every woman of that time was named Mary? Or so it seemed! Public Garden: The “Make Way for Ducklings” statues were a hit with the girls. We also enjoyed the swans, the pond, the bridge…it was very peaceful. Beacon Hill: The shops are so cute and the old brownstones are gorgeous. I’m sure they cost more money that I will see in a lifetime! Harvard: Founded in 1636. Now that’s old. There was an archeology class digging up the yard looking for artifacts while we were there. Students and faculty bustled about. People biking. People walking. People conversing. People studying. I felt smarter as soon as I walked in the gate. Harvard Square: This area has tons of shopping, coffee shops, tea shops, students, tourists…it was really busy! Bella had a great time chasing the pigeons and hugging Catherine. We met another friend, Kit, in Harvard Square. She is an engineer and she works and lives right there. She took us all out for Vietnamese food…yum! She knitted Bella an adorable scarf made of bamboo! It was a quick one-day visit, but we saw A LOT of sites. Rebecca used to be a tour guide, so she knew TONS about the city and how to get around. Peter was a wealth of knowledge as well. It was a huge blessing to have them along. We were glad to have a crash course in train-riding before we tackled NYC the next day. Weeeeee!